Niagara County is a county in the U.S. state of New York. As of the 2010 census, the population was 216,469. The county seat is Lockport. The county name is from the Iroquois word Onguiaahra; meaning the strait or thunder of waters. Niagara County is part of the Buffalo–Niagara Falls metropolitan area, and across the Canada–US border is the province of Ontario. It is the location of Niagara Falls and Fort Niagara, and has many parks and lake shore recreation communities. In the summer of 2008, Niagara County celebrated its 200th birthday with the first town of the county, Town of Cambria. 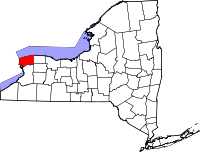 When counties were established in the New York colony in 1683, the present Niagara County was part of Albany County. Prior to the British, the area was part of New Netherland. Niagara was an enormous county, including the northern part of New York State as well as all of the present State of Vermont and, in theory, extending westward to the Pacific Ocean. This county was reduced in size on July 3, 1766 by the creation of Cumberland County, and further on March 16, 1770 by the creation of Gloucester County, both containing territory now in Vermont. In the years prior to 1776, most of the Loyalists in Tryon County fled to Canada including the likes of local judge John Butler and militia commander Sir John Johnson. In 1784, following the peace treaty that ended the American Revolutionary War, the name of Tryon County was changed to honor the general, Richard Montgomery, who had captured several places in Canada and died attempting to capture the city of Quebec, replacing the name of the hated British governor. In 1789, Ontario County was split off from Montgomery. In turn, Genesee County was created from Ontario County in 1802. Niagara County was created from Genesee County in 1808. It was, however, larger than the present Niagara County even though it consisted of only the Town of Cambria. From 1814 to 1817, records of Cattaraugus County were divided between Belmont (the seat of Allegany County) and Buffalo (then in Niagara County). In 1821, Erie County was created from Niagara County. The county has a number of properties on the National Register of Historic Places. According to the U.S. Census Bureau, the county has a total area of 1,140 square miles (3,000 km2), of which 522 square miles (1,350 km2) is land and 617 square miles (1,600 km2) (54%) is water. Niagara County is in the extreme western part of New York State, just north of Buffalo and adjacent to Lake Ontario on its northern border and the Niagara River and Canada on its western border. The county's primary geographic feature is Niagara Falls, the riverbed of which has eroded seven miles south over the past 12,000 years since the last Ice Age. The Niagara River and Niagara Falls, are in effect, the drainage ditch for four of the Great Lakes which constitute the world's largest supply of fresh water. The water flows north from Lake Erie, then through the Niagara River, goes over Niagara Falls, and then on to Lake Ontario and the St. Lawrence River, eventually emptying into the North Atlantic Ocean. Today, tourists and visitors to the Falls see a diminished flow of water over the Falls, since a portion of the flow has been diverted for hydroelectric power purposes. Both the American and Canadian side of the Niagara River have massive electrical power plants. The spectacular Niagara Gorge is the path Niagara Falls has taken over thousands of years as it continues to erode. Niagara Falls started at the Niagara Escarpment which cuts Niagara County in half in an east-west direction. North of the Escarpment lies the Lake Ontario plain, which is a fertile flatland used to grow grapes, apples, peaches and other fruits and vegetables. The grape variety Niagara, source of most American white grape juice but not esteemed for wine, was first grown in the county, in 1868. Viticulture, or wine culture has begun to take place, with several wineries below the escarpment. This has helped to improve the depressed economy of the region. To further capitalize on economic development, the state has created the Niagara Wine Trail. De Veaux Woods State Park, north of the City of Niagara Falls. Devil's Hole State Park, immediately north of the City of Niagara Falls. Fort Niagara State Park, located at the mouth of the Niagara River. Earl W. Brydges Artpark State Park, in the Town of Lewiston. Four Mile Creek State Park, on the shore of Lake Ontario. Golden Hill State Park, on the shore of Lake Ontario. Hartland Swamp Wildlife Management Area—a conservation area in the Town of Hartland. Joseph Davis State Park, along the Niagara River. Niagara Reservation State Park, in the City of Niagara Falls. Reservoir State Park, south of the power reservoir. Tonawanda Wildlife Management Area, partly in the Town of Royalton. Wilson-Tuscarora State Park, on the shore of Lake Ontario. Niagara County was long a Democratic county, voting Democratic since 1980 with the exception of Reagan's 1984 landslide. However, in 2016, Trump's appeal with white-working class voters flipped this county to a decisive 18-point Republican win, bigger than Reagan's 11-point win. Niagara County is governed by a 15-member Legislature, with the Chairman of the Legislature as the de facto head of county government. Currently, there are 11 members of the Republican-led Majority Caucus and four members of the Democrat-led Minority Caucus. The Legislature formerly consisted of 19 members, but was downsized to 15 seats effective January 1, 2012 based on the results of a public referendum. A subordinate county manager reports to the County Legislature. Richard Updegrove, who previously served as Republican Majority leader for 8 years, is Niagara County Manager. Governing functions of the Legislature rely on a committee system; currently, there are five standing committees and one long-term ad hoc committee. The five standing committees are Administration, chaired by Nemi; Community Services, chaired by McNall; Community Safety and Security, chaired by Godfrey; Economic Development, chaired by Lance; and Public Works, chaired by Syracuse. An ad hoc Refuse Disposal District Committee is chaired by Hill. The Administration Committee has oversight of the following government departments: County Manager, County Attorney, Management & Budget, Treasurer, Audit, Real Property, Data Processing, Legislature Office, Printing/Mailing, Human Resources, Civil Service, Risk Management, and Board of Elections. The Community Services Committee has oversight of the following government departments: Social Services, Employment & Training, Youth Bureau, Office of Aging, Public Health, Mental Health, NCCC, County Clerk/DMV, Historian, and Veterans Services. The Community Safety and Security Committee has oversight of the following government departments: Sheriff, District Attorney, Public Defender, Probation, Fire Coordinator/Emergency Services, and Coroners. The Economic Development Committee has oversight of the Niagara County Center for Economic Development and the Niagara County Industrial Development Agency. The Public Works Committee has oversight of the following government departments: Public Works, Parks/Golf Course, Refuse Disposal District, Sewer District, Water District, and Weights & Measures. Additionally, the ad hoc Refuse Disposal District Committee has oversight of that District. The dominant political party in the Niagara County Legislature is currently the Republican Party, which is ancestrally the dominant party in Niagara County. In addition to the areas mentioned above, much of Niagara County is serviced by a Water District and a Sewer District. Both bodies are subordinate to the County Legislature; the former has a direct relationship, while the latter is currently under limited oversight of the town supervisors within the district. Coroner, 2nd District Joseph V. Mantione (R) Mantione is also the senior coroner, having served longest of the four county coroners. As of the census of 2010, there were 216,469 people, 87,846 households, and 58,593 families residing in the county. The population density was 420 people per square mile (162/km²). There were 95,715 housing units at an average density of 183 per square mile (71/km²). The racial makeup of the county was 90.70% White, 6.15% Black or African American, 0.94% Native American, 0.58% Asian, 0.02% Pacific Islander, 0.40% from other races, and 1.21% from two or more races. 1.33% of the population were Hispanic or Latino of any race. 23.6% were of German, 18.1% Italian, 11.3% Irish, 11.2% Polish and 8.3% English ancestry. 94.5% spoke English, 1.6% Spanish and 1.0% Italian as their first language. There were 87,846 households out of which 30.90% had children under the age of 18 living with them, 50.30% were married couples living together, 12.30% had a female householder with no husband present, and 33.30% were non-families. 28.60% of all households were made up of individuals and 12.00% had someone living alone who was 65 years of age or older. The average household size was 2.45 and the average family size was 3.03. In the county, the population was spread out with 24.70% under the age of 18, 8.50% from 18 to 24, 28.40% from 25 to 44, 23.10% from 45 to 64, and 15.40% who were 65 years of age or older. The median age was 38 years. For every 100 females there were 93.30 males. For every 100 females age 18 and over, there were 89.50 males. The median income for a household in the county was $38,136, and the median income for a family was $47,817. Males had a median income of $37,468 versus $24,668 for females. The per capita income for the county was $19,219. About 8.20% of families and 10.60% of the population were below the poverty line, including 15.00% of those under age 18 and 7.30% of those age 65 or over. Niagara University is located in Lewiston, New York. Niagara County Community College is located in Sanborn, New York. Many Niagara County residents also attend Erie and other Western New York County Schools. In the Buffalo Metro area there are more than 20 public and private colleges and universities offering programs in technical and vocational training, graduate, and professional studies. ^ W, Eric (2012-04-02). "Congressional District 26" (PDF). View 2012 Congressional Maps. Albany, New York: The New York State Legislative Task Force on Demographic Research and Reapportionment. Retrieved 2013-01-13. ^ W, Eric (2012-04-02). "Congressional District 27" (PDF). View 2012 Congressional Maps. Albany, New York: The New York State Legislative Task Force on Demographic Research and Reapportionment. Retrieved 2013-01-13. ^ W, Eric (2012-03-02). "Senate District 62" (PDF). View 2012 Senate District Maps. Albany, New York: The New York State Legislative Task Force on Demographic Research and Reapportionment. Retrieved 2013-01-06. ^ W, Eric (2012-01-25). "Assembly District 140" (PDF). View Proposed 2012 Assembly District Maps. Albany, New York: The New York State Legislative Task Force on Demographic Research and Reapportionment. Retrieved 2013-01-16. ^ W, Eric (2012-01-25). "Assembly District 144" (PDF). View Proposed 2012 Assembly District Maps. Albany, New York: The New York State Legislative Task Force on Demographic Research and Reapportionment. Retrieved 2013-01-16. ^ W, Eric (2012-01-25). "Assembly District 145" (PDF). View Proposed 2012 Assembly District Maps. Albany, New York: The New York State Legislative Task Force on Demographic Research and Reapportionment. Retrieved 2013-01-16. ^ W, Eric (2012-01-25). "Assembly District 146" (PDF). View Proposed 2012 Assembly District Maps. Albany, New York: The New York State Legislative Task Force on Demographic Research and Reapportionment. Retrieved 2013-01-16. History of Niagara County, New York: With Illustrations Descriptive of Its Scenery, Private Residences, Public Buildings, Fine Blocks, Public Manufactures, and Portraits of Old Pioneers and Prominent Residents. New York: Sanford & Co., 1878. John Theodore Horton, Edward Theodore Williams, and Harry Stevens Douglass, History of Northwestern New York: Erie, Niagara, Wyoming, Genesee and Orleans Counties. Lewis Publishing Co., 1947. Robert D. Kostoff, A History of Niagara County, New York. Lewiston, NY: Edwin Mellen Press, 2001. Niagara County Pioneer Association, Souvenir History of Niagara County, New York: Commemorative of the 25th Anniversary of the Pioneer Association of Niagara County. Lockport, NY: The Lockport Journal, 1902. William Pool, Landmarks of Niagara County, New York. Syracuse, NY: D. Mason & Co., 1897. Samuel T. Wiley and Winfield Scott Garner, Biographical and Portrait Cyclopedia of Niagara County, New York. Philadelphia: Gresham Publishing Co., 1892. Edward T. Williams, Niagara County, New York: A Concise Record of Her Progress and People, 1821-1921, Published during Its Centennial Year. In Two Volumes. Chicago: J.H. Beers & Co., 1921.